As a mother, you read thousands of books to your children. Exciting, fun books, goodnight books, time to relax kids! 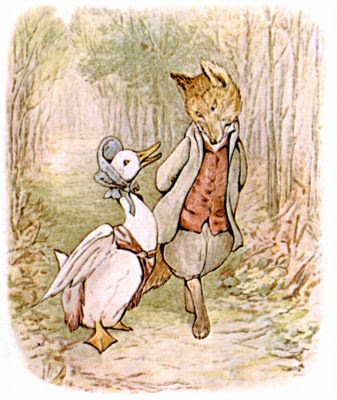 A childhood favourite of both my children and mine is author Beatrix Potter. We've all read them (I hope). Famous Peter Rabbit is my favourite. As a quick post, I thought that I would point out how cute some of these names were. Well lets start with the author herself - Helen Beatrix Potter. Helen or Helena are beginning to come into use. Beatrix or Beatrice are names which continue to grow in popularity (though not too much). Its sophisticated and fun, and you have to love the nickname Bea!! Jemima Puddle duck also has a lovely name. Jemima is a favourite of mine at the moment. Its oh so British I would say. Its great as a first or middle name. She uses, in her books, distinguished boys names such as Peter, Tom, Benjamin and Samuel aswell. These are names which last through the ages, and can easily be teemed with a lively middle name, if you wish, to jazz them up such as Kingston, or Leif, or maybe Rafael? I adore Jemima- especially with the nicknames Mina or Mimi. Her Father was Rupert and her Brother Bertram. Rupert is darling! A rupert and Beatrice would go great together!